Somebody had a logo competition announcement, maybe people can send their ideas to a web-site.. Anyway, this one looks like the poor penguin is not really strong enough to hold up the world, and it’s going to get squashed. Not a good, positive logo, in that respect..
Now, when you think about penguins, first take a deep calming breath, and then think “cuddly”. Take another breath, and think “cute”. Go back to “cuddly” for a while (and go on breathing), then think “contented”. Now, with penguins, (cuddly such), “contented” means it has either just gotten laid, or it’s stuffed on herring. Take it from me, I’m an expert on penguins, those are really the only two options. Now, working on that angle, we don’t really want to be associated with a randy penguin (well, we do, but it’s not politic, so we won’t), so we should be looking at the “stuffed to its brim with herring” angle here. So when you think “penguin”, you should be imagining a slighly overweight penguin (*), sitting down after having gorged itself, and having just burped. It’s sitting there with a beatific smile - the world is a good place to be when you have just eaten a few gallons of raw fish and you can feel another “burp” coming. (*) Not FAT, but you should be able to see that it’s sitting down because it’s really too stuffed to stand up. Think “bean bag” here. Now, if you have problems associating yourself with something that gets off by eating raw fish, think “chocolate” or something, but you get the idea. NOW comes the hard part. With this image firmly etched on your eyeballs, you then scetch a stylizied version of it. Not a lot of detail - just a black brush-type outline (you know the effect you get with a brush where the thickness of the line varies). THAT requires talent. Give people the outline, and they should say [ sickly sweet voice, babytalk almost ]”Ooh, what a cuddly penguin, I bet he is just _stuffed_ with herring”, and small children will jump up and down and scream “mommy mommy, can I have one too?”. be the logo, and the others would just be that cuddly penguin being used as an actor in some tableau. James Hughes fue la primera persona en llamar al pingüino “Tux”, quien dijo que su nombre venía de “(T)orvalds (U)ni(X)”. 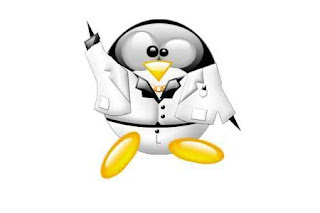 Tux nació en un concurso de logotipos de Linux… de hecho hay mucha confusión en esto, ya que realmente fueron tres los concursos en busca del logotipo de Linux, y parece ser que Tux no gano ninguno de ellos, es esta la razón por la que Tux es oficialmente conocido como la mascota de Linux, no el logotipo. Larry Swing fue el creador de Tux, que como es de esperar se diseño bajo Linux y la versión 0.54 de GIMP. - Aparentemente este Pingüino no pertenece a ninguna de las 19 especies que existen, pero si tiene un parecido a Adelie penguin, y es vestido o retratado de manera diferente según el contexto… para parches de seguridad del Kernel, lleva casco, los ojos rojos y un hacha en la mano. - Durante el COMDEX del 1999 se le preguntó a Linux si tená idea de cuantos pinguinos de peluche se le habían enviado a Hill Gates, en el que respondió con otra pregunta.. ¿Cerca de mil?. - El tatuaje de Tux se conoce también como “Tuxtoo”. - Otro uso sin crédito de Tux se puede ver actualmente en dunk the scammer, donde el diseño aparentemente intenta asociar a Tux como símbolo de la delincuencia en Internet.